From Mysterious Reviews: This fast-paced international thriller featuring Cotton Malone includes extended passages that link the cultural history of China with its present political environment, providing a fascinating backdrop for the retired Justice Department operative's quest for an ancient artifact. 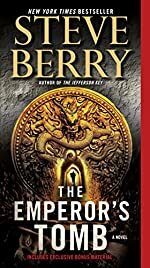 Synopsis (from the publisher): The tomb of China's First Emperor, guarded by an underground army of terra-cotta warriors, has remained sealed for more than 2,000 years. Though it's regarded as one of the greatest archaeological sites in the world, the Chinese government won't allow anyone to open it. Why? That question is at the heart of a dilemma faced by former Justice Department operative Cotton Malone, whose life is shattered when he receives an anonymous note carrying an unfamiliar Web address. Logging on, he sees Cassiopeia Vitt, a woman who's saved his life more than once, being tortured at the hands of a mysterious man who has a single demand: Bring me the artifact she's asked you to keep safe. The only problem is, Malone doesn't have a clue what the man is talking about, since Cassiopeia has left nothing with him. So begins Malone's most harrowing adventure to date—one that offers up astounding historical revelations, pits him against a ruthless ancient brotherhood, and sends him from Denmark to Belgium to Vietnam then on to China, a vast and mysterious land where danger lurks at every turn.